This guide to blending and brewing healthful herb teas includes easy-to-make recipes and anecdotes from several renowned herbalists. Readers will find teas for the head and throat, digestion, nervous system, lungs, bones and joints, skin, and more. The Definition of a Superb Chamomile Tea! Summary : This is an absolutely superb chamomile tea, with a strong lemon and citrus flavor. If you love lemon...you'll fall in love with this tea. And for those who worry about a "burnt aroma" found in some other chamomile teas...forget it...as you won't find it here. Review : I love chamomile teas. A chamomile tea, especially if taken with some wine a bit earlier, is a absolute cure for insomnia...at least for me. Have some wine...chill for a bit...then have a chamomile tea and presto, I'll be sleepy and then dead-tired in about 10 minutes. As such, I've found chamomile teas are the absolutely perfect bedtime tea, whether you have insomnia or not. Yet, as anyone who has drank straight chamomile tea knows...the taste can be rather bland, which is of course the point actually. Still, I always love strong flavored teas...even before bedtime. And as such, I'm always intrigued by chamomile teas that contain "other things," and look forward to trying these types of chamomile teas before heading off to bed. And so tonight...after my obligatory glass of wine and late-night walk...I decided to try a chamomile tea from Mighty Leaf called chamomile citrus. This tea contains the following ingredients : Rosehips, orange peels, chamomile flowers, lemon grass, lemon myrtle, nana mint, hibiscus flowers, natural citrus flowers, natural flavors. 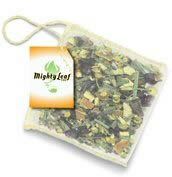 As with all Mighty Leaf teas that are "bagged," the bag itself is more a pouch and more closely resembles those pyramid tea bags you see from time to time. But more importantly than the bag is what is contained in it...as in all Mighty Leaf tea pouches you'll find FULL SIZED loose-leaf teas. Thus, you can have your cake (high quality loose-leaf leaves) and eat it too (convenience of a tea bag for brewing and thus no clean-up). I know immediately after ripping open the wrapper of the tea pouch that I was absolutely going to love this tea. The aroma from the tea was, by far, the strongest I've ever had from a chamomile tea. Indeed...it is one of the strongest aromas of any tea I've tried. And that aroma is of lemon and other citrus fragrances...although the lemon fragrance most definitely dominates. And wow...the fragrance of this tea is simply delightful. And so...with these high hopes, I sat impatiently around waiting for the 5 minute brew time. Well, the wait was worth it...as the flavor of this chamomile tea is absolutely, totally superb. This creation from Mighty Leaf simply combines the best flavors of chamomile tea with the powerful and full flavor found in good quality lemon teas. And the result is simply spectacular. Indeed, if you didn't know that this was a chamomile tea, you'd be hard pressed to find it from the teas flavor. By and large, this is a lemon tea...as all the "lemony" ingredients found in this tea probably suggest. And the flavor is super strong, with an after-taste that simply will not go away! Now, there are a few other things in this tea. But good luck finding any other flavors besides lemons...which truthfully is fine with me. A lemon flavored chamomile tea is to me one of the finest bedtime teas you can have, so who can want more? Overall, this tea is simply the definition of a superb chamomile tea that uses high-quality leaves. The mix of flavors produces a strong and delightful lemon flavored tea. And...most happily...the tea totally lacks the "burnt aroma" and "burnt taste" that you can sometimes get in poor quality chamomile teas, particularly those chamomile teas from grocery store brands. Recommendation : Absolutely and Positively! This is the best chamomile tea I've ever had and is also one of the best lemon teas I've had too. And being a chamomile tea, it is guaranteed to go a long ways towards helping you go to sleep. And this property of chamomile tea is now working its wonders on me...as I'm fast falling asleep in front of my computer. So good night. Brewing Instructions : Pour boiling water over tea bag. Let brew for 5 minutes.